The Wolfpack is an elite unit of knights pledged to serve and protect House Liacan, ensuring their place as the rightful rulers of Terenia. They were formed as royal bodyguards to Duke Demiqas Liacan I and took holy vows binding their fealty to him. 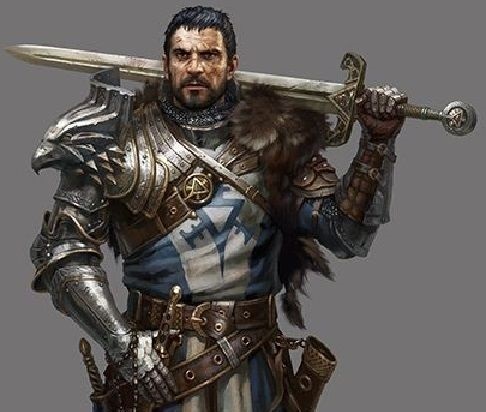 First assembled by Lord Commander Gregor Vane, a seasoned warrior from the terenian civil war, they were consisting of the greatest and most renowned fighters from well known and respectable houses. Having the realm's finest swords rush to his side proved a great aid to Demiqas, who had started a war to reclaim his homeland. And while the war in Terenia is still not over, their courage and ferocity in battle have been heard of far and wide. 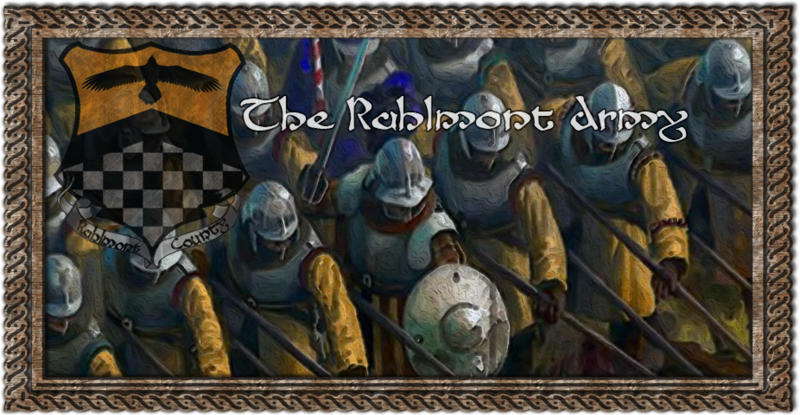 Consisting of the allied forces of Watcher's Rock, Vandemar and Verdarcragg, the Rahlmont army was mobilized to protect its own lands and neighboring Counties in face of grave danger. An ancient chivalric order pledged to serve the current ruling Lord of Watcher's Rock. They swear to be brave and just, and to defend the innocent, the weak, and children. A group of mercenaries hired by Grenric Layne after winning the battle of Tenarath. They have a contract with the Count, providing additional security when needed, fighting alongside him in battle or fulfilling other tasks. A knightly, or chivalric, order founded well over a century ago by Zykas Latos. The order is bound in loyalty directly to the Lord of House Latos itself. It's original purpose was to serve as an elite unit in the field for House Latos, but that purpose has since been transcended. Nowadays the order has a gamut of uses. First and foremost they are still an elite force bound to House Latos to serve in battle of need be. But as the decades have passed, they have also grown to become an intelligence gathering unit, advisors to the Lord, and a personal guard for the Lord or other House Latos members on the Lord's command. At the Terenian Intelligence Agency (TIA) our mission is clear. We work secretly overseas, developing foreign contacts and gathering intelligence that helps to make the Duchy safer and more prosperous. We help the Duke identify and exploit opportunities as well as navigate risks to our Duchy's security, military effectiveness and economy. We work across Elyria to counter terrorism, resolve international conflict and prevent the spread of advanced weaponry. We are here to help protect Terenia’s people, economy and interests. An organisation of local craftsmen in association with the Count of Rahlmont and Terenia's industrial branch. They organize construction projects, being hired by the local aristocracy or the Count himself to assist building out Rahlmont's infrastructure. A business venture started by Devron Layne, working with different kinds of wares and products which are sold all throughout the land to consumers, other businesses and government institutions. They maintain stock and shop of resources. 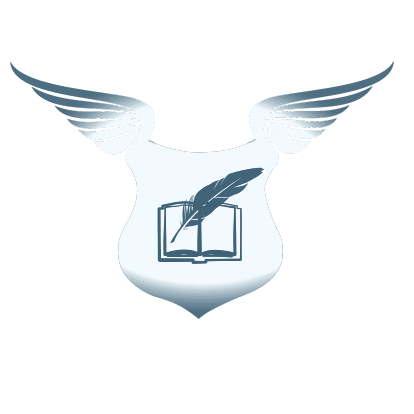 "The Bard's College of Terenia, based in Tenarath, is a society for bardic arts with a sinister touch. Functioning as a school and martial training ground, it's intended for those interested in music education (bardic skills) and/or in specialising in support/intelligence gathering skills. It sees itself as playing a vital part in preserving terenian culture and order, being directly affiliated with the Terenian Council. Talented individuals from far and wide can share their work, hone their skills or improve upon them by learning from others." Builds and books is located in the demalion empire / The duchy of terenia/ The County of Lyanthea/ The Town of Tenerath. The Guild is going to be specialising in architecture, building and the collection of stories and books for the library located in our guild house.